Meade’s Deep Sky Imager camera series is back with the new DSI IV which is most advanced camera ever offered in the series. Equipped with a 16-megapixel Panasonic CMOS image sensor, regulated two-stage thermoelectric cooler, and 3.8-µm pixels, the new DSI IV is the ideal camera for all your astrophotography pursuits. 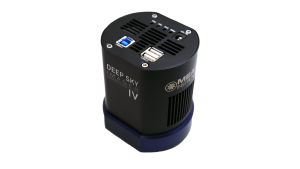 The low-noise, high-resolution and fast USB 3.0 readout make this camera suitable for both deep-sky and planetary imaging, making it one of the most versatile astronomy cameras available. The camera comes packaged with a new version of Meade’s SkyCapture camera-control software. With complete camera control for all major operating systems, including Windows, Mac OS X and Linux, SkyCapture can run automatic image-capture sequences without the need to purchase additional software. – Product Dimensions: 3.4 inches by 3.2 inches by 4.1 inches. Accessories included by Meade with the new DSI IV consist of a high-quality, weather-resistant, hard carrying case; AC power adapter; and high-speed USB 3.0 cable. Pricing for the package is $1199US for the monochrome version and $999US for the color version.